Posted on July 25, 2013 by Michele D.
I took Zoe to see Despicable Me 2 this week, and I think Eduardo’s Cinco de Mayo party got both of us in the mood for Tacos … and that cool guacamole-filled Mexican hat made of a big tortilla chip. Does anything like that really exist? When I was growing up, we had a few taco nights at our house but not nearly enough to suit me. As an adult, I now understand that taco night takes a lot of effort. It’s not difficult to make tacos, but there are lots of moving piece-parts so you have to make sure you’re prepared with all the right ingredients and have plenty of time to put it all together. The finished product though … totally yummy and awesome. And while I was at it, I went ahead and mixed up a big blender batch of margaritas because one can’t have tacos without margaritas right? When I first started trying to make kosher tacos, I had a heck of a time finding Kosher taco seasoning. I visited numerous stores and was about to give up when I found Kosher Ortega Taco Seasoning at Target. I was so excited that I ended up ordering a case from the amazon.com. 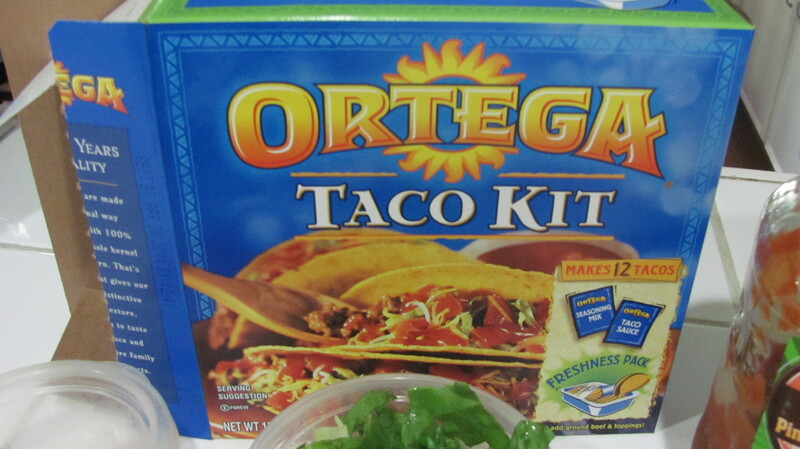 Ortega hard taco shells (I even found an Ortega Taco Dinner Kit at Tom Thumb that included the shells, taco seasoning and sauce). Tofutti Sour Cream (Kosher pareve) I forgot to buy this when I was shopping and sadly missed it during our Taco night. The “fake” sour cream makes tacos so delish. Preheat oven to 350 degrees for Taco Shells. 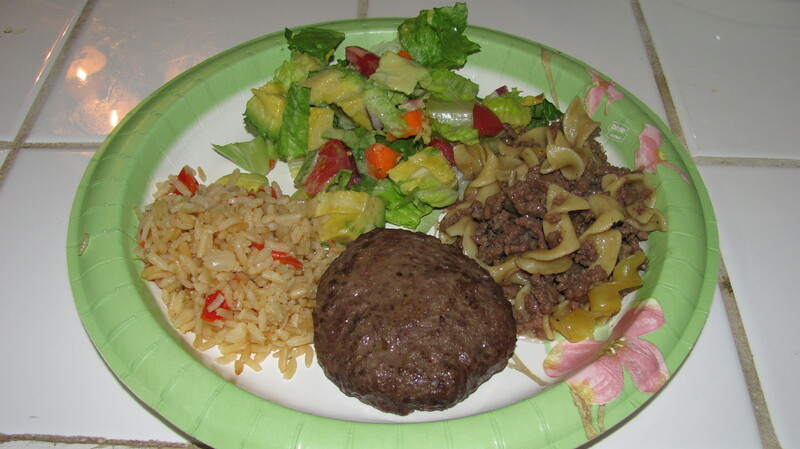 Cook hamburger meat in a skillet over medium to high heat until down. I prefer NO pink at all but my hubbie is a little more flexible with this rule. Add a bit of salt, pepper and garlic if you’d like. Drain the hamburger meat and return skillet to the burner. Add package of Taco Seasoning and 1/2 – 1 cup of water, depending on your preferred consistency. 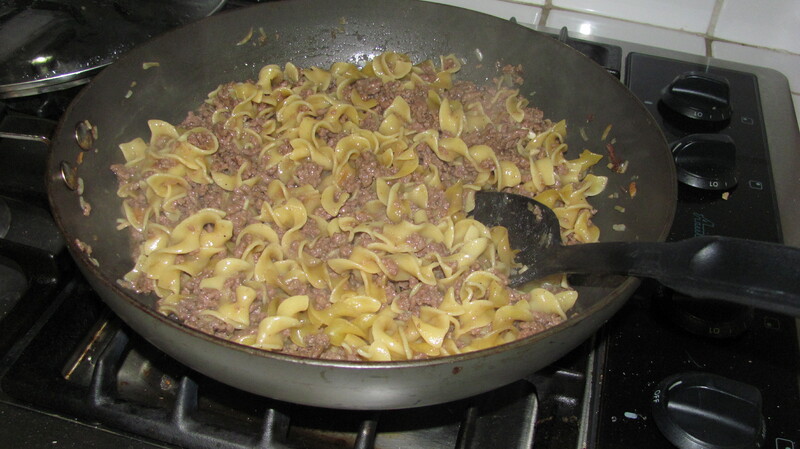 I like the taco meat to be a bit soupy so I usually add about 3/4 cup of water. Be sure to pour the water over the taco seasoning powder to make it easier to mix in. Stir it all up to cover all hamburger meat with the seasoning. Bring to a boil, lower temp to medium-ish and cook for 15-20 additional minutes. 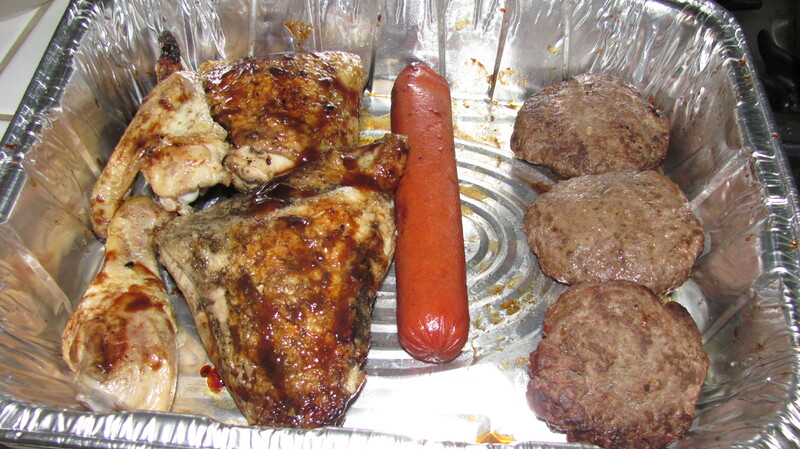 I usually cover the meat but it’s not necessary. While the taco meat finishes cooking, prepare your taco sides. 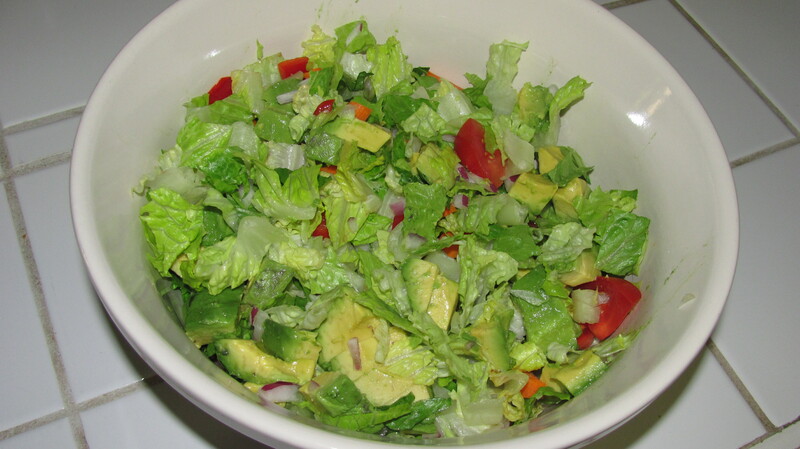 Shred lettuce; chop up tomatoes, onions and olives; make guacamole (avocados, lemon juice, salt, pepper, garlic powder) and place each item in it’s own small bowl to make it easy for dinner guests to serve themselves. You can also pour some salsa into a pretty bowl for easy serving. Place taco shells on cookie sheet and bake for 3-4 minutes in oven. Line up your items on a kitchen counter or table in an assembly line style: Taco Shells and Tortillas, Taco meat, Salsa, fake sour cream, lettuce, tomatoes, onions, olives, etc. and let everyone build their own tacos. You can be very creative with tacos. Use any ingredients that you like: substitute turkey or fish for the hamburger meat, add chopped up jicama or even red bell peppers. 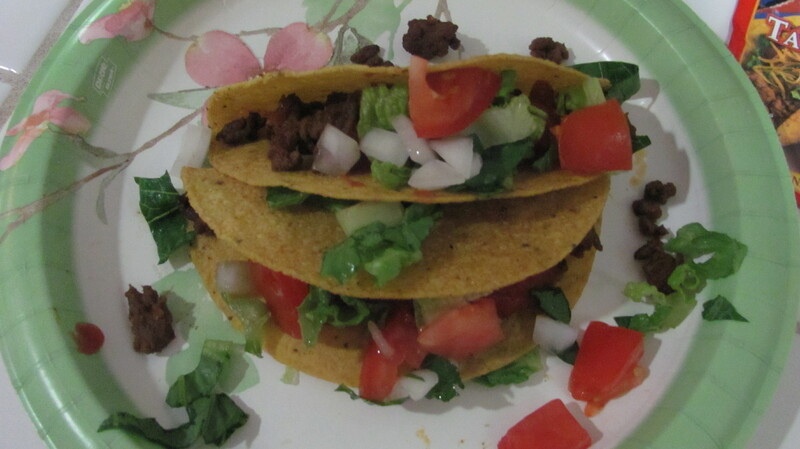 Tacos are one of those foods that you can be as creative as you’d like and not run to much risk of messing up. This particular batch was so delicious, I’m ashamed to admit I had 3 of them … and probably could have eaten more if my good sense hadn’t stopped me. Posted on July 16, 2013 by Michele D.
We took a few days for a little rest and recovery in Siesta Key, Florida. The beach was beautiful despite the rain that had pounded and flooded the area the day we arrived. And the Capri at Siesta was an adorable and relaxing place to stay and just a few minutes walk from the lovely beach. 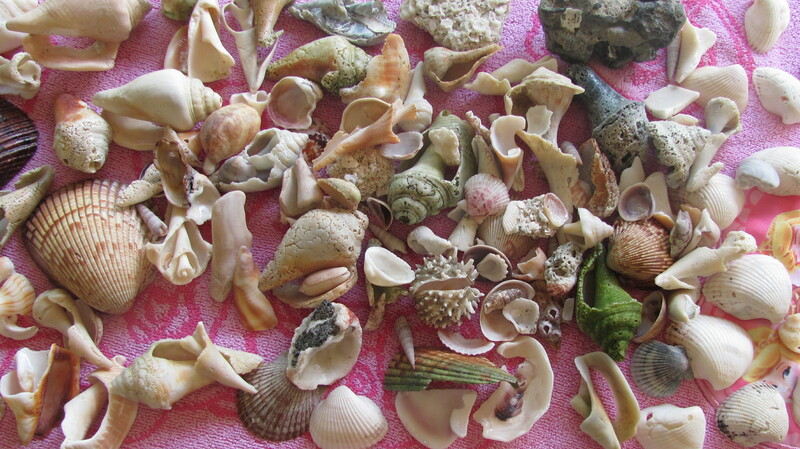 Pictured above are the seashells we gathered while we were staying there … most of them thanks to my husband’s brave diving skills. No Kosher cooking was involved, even though we had a great kitchen in our room, but we truly needed the R&R and the sound of the ocean to refresh ourselves … and we hope to go back very soon. Happy summer and Happy Kosher Treif Cooking! Posted on July 5, 2013 by Michele D.
If you’ve been reading my blog this week, you know we’ve been so blessed to receive so many delicious Kosher meals from friends and neighbors after the death of my Mother. And each day a new meal arrives, it seem to remind me of a happy memory long forgotten or fill a physical need that I didn’t even know we had. I know it’s a trite saying, but Hashem truly does give us exactly what we need, when we need it … at least most of the time. Last night before the food arrived, Zoe, who was exhausted from a day at camp, started whining about how much she wanted pizza. I really was too tired to cook, but because I knew how tired she was and because she rarely asks for specific food or even eats for that matter, I decided to make her a small pizza. When she saw I was making pizza, she said, “NO! 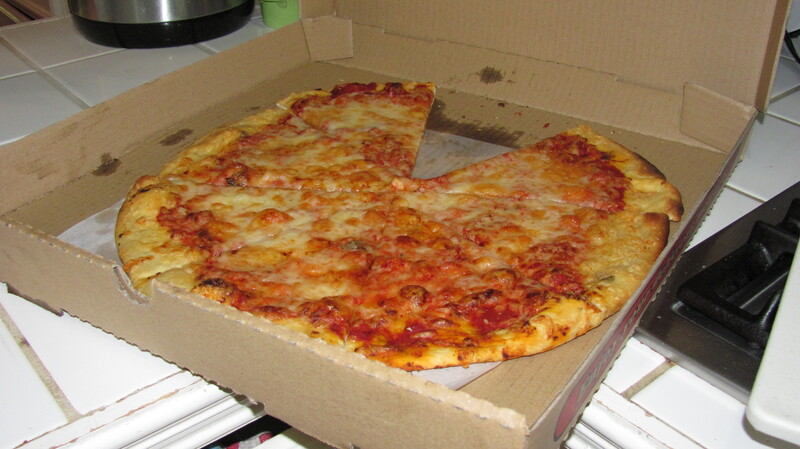 I want to go get pizza at Mon Ami, I don’t want YOUR pizza!” Well thanks a lot missy but this is what you are getting tonight so hush. 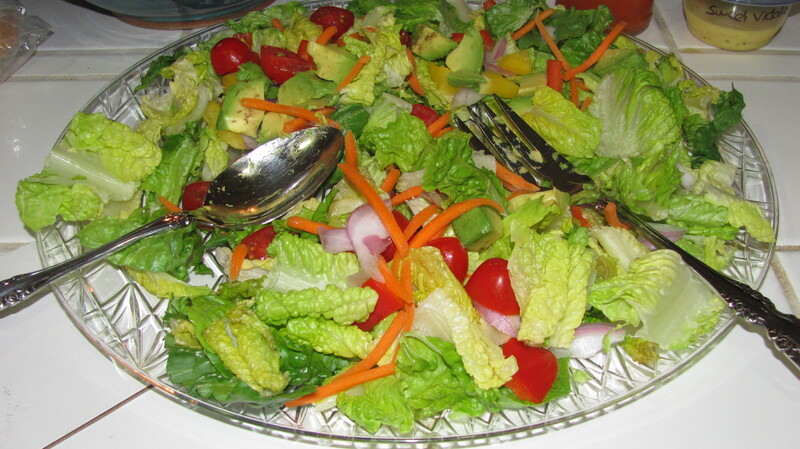 To go with the pizza, another friend, neighbor and one of Zoe’s former teachers delivered the beautiful salad that you see pictured above, and we finished it all off with a delicious cheesecake pie that we received the night before (photos and more on that later). Receiving this food has made such a difference in our lives this week. It has allowed me to spend time thinking about my Mother instead of standing in front of the pantry trying to figure out what to make for dinner. And it has been a treat for Zoe and Neil to not have to eat my food every day, which I’ll admit can be fairly non-creative after a long day of work. Thanks so much to all of you who have worked so hard to prepare food for us. We have enjoyed the break and the yummy meals so much. Posted on July 3, 2013 by Michele D.
Bake at 375°F. 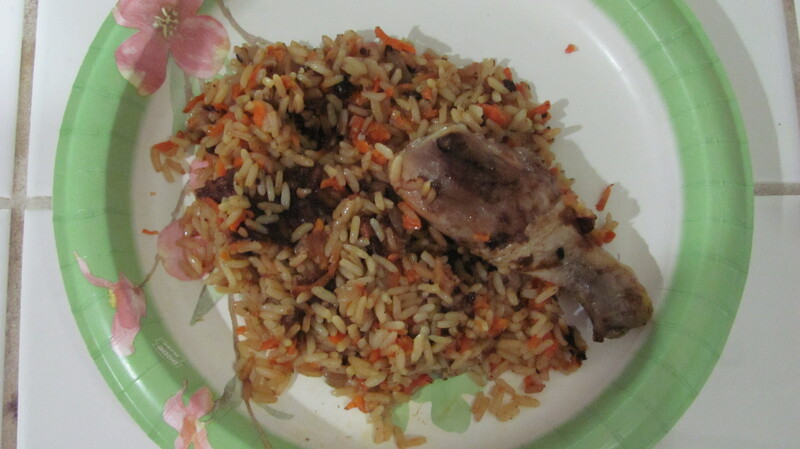 for 45 minutes or until the chicken is cooked through and the rice is tender. Let stand for 10 minutes. Stir the rice before serving. I’m so glad my Mother-in-law brought over the delish dish that reminded me of my Mom’s very easy to make Chicken and Rice Bake. I’m going to add this one to my dinner menu some time in the next few weeks. It’s comfort food at it’s best. Posted on July 1, 2013 by Michele D.
When my mom was alive, she’d call me just as we hit LBJ Freeway in Dallas to ask, “are you home yet?” Back then, it drove me nuts. “Of course we aren’t home yet or I would have called you!” But last night I cried for a bit when I realized we’d never have that exchange again. It’s so final and so awful to think about. As we were driving home, several people called and texted to say they were planning meals for us for the week. Now being from the South and all, I hate it when folks go out of their way to help me. It makes me uncomfortable in a big way. I don’t need help. I can do this on my own. So I protested. The ladies said they knew I’d say that so they went ahead and arranged meals for the week anyway. I was flustered and a bit angry. How dare them decide something like this without my permission. 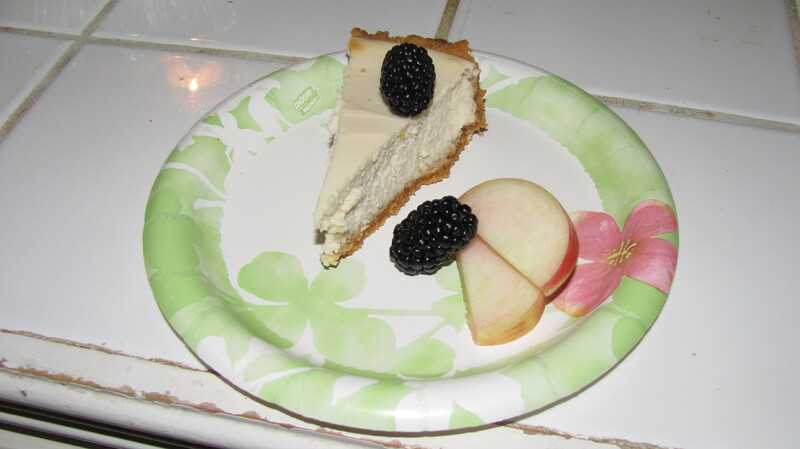 And then the first night of food arrived … from two of the best Kosher cooks in my community. It did look tasty. And I am kind of tired and in a bit of a fog. Maybe I could deal with people bringing me food for a week. It didn’t take long to warm up to the idea. So the photos you see are of the amazing, delicious food that my wonderful friends brought us today to make our lives a bit easier after losing my Mom. And the Kosher Hamburger Helper? Well, that’s a special treat requested by my daughter and made in honor of my Mom, who was one of the best Treif cooks I know. We ALL loved Hamburger Helper night at her house, not to mention her fried chicken and pork chops (yes I said it – Treif!) 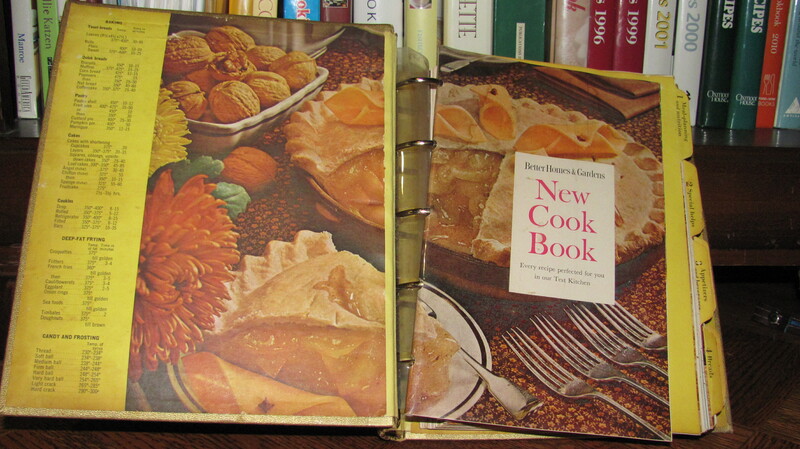 and pot roast and even plain ole bologna sandwiches … which back then were eaten with cheese (More Treif). All of the food in my Mom’s house was excellent. And while I did not inherit her skill of cooking, I did bring home a few of her cookbooks, all of which are well used and loved (also see photo). If your parents are still around, give them a hug this week and maybe get in the kitchen and cook a dish or two with your mom. Life is short and should be enjoyed and appreciated as often as possible. Happy Kosher Treif Cooking and a very sad goodbye to my special Mom.